Haven’t blogged in a bit, mostly because of time. It has been busy at my new job . Strike that. Not busy, but crazy. I know purists might just prefer to hear I Left My Heart in San Francisco or Talking Baseball, but humor me. It’s November, 70s and Sunny! What a beautiful weekend it was in San Francisco. A great weekend to get out to play and watch sports. 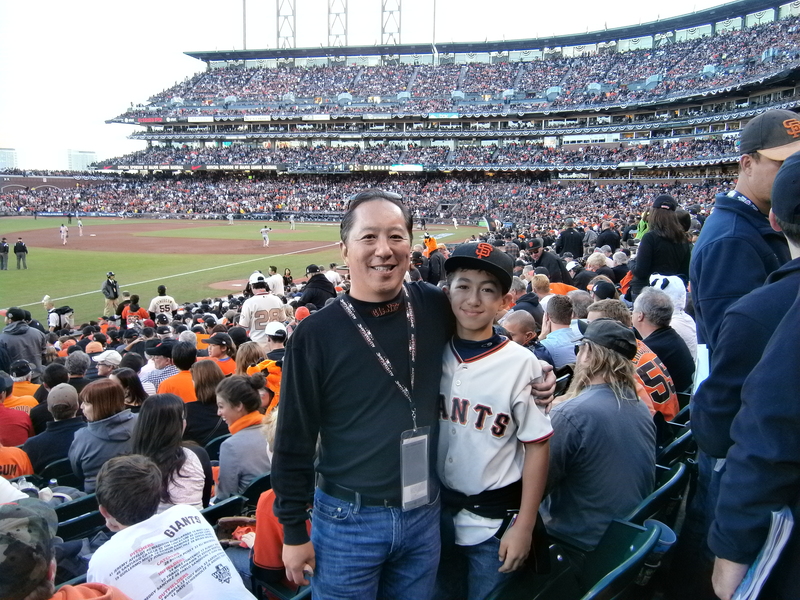 Many Sports weekends of my youth were spent with my dad at sporting events. If you grew up in my generation in San Francisco and played sports or followed sports, there were three main sports you followed: football, basketball and baseball. We had a hockey team (the San Francisco Seals) but they weren’t followed by many. For me though, my dad took me to see the main sports. My fondest memories of my dad were days like this weekend. I remember my first baseball game and meeting the pitcher Gaylord Perry and my dad talking about his spitter. I also remember that the pitcher did not appreciate the connotation that he was noted as a cheater. We stayed after Warriors basketball games too so I could get Rick Barry’s autograph. We hung out after 49er games so I could get Steve Spurrier’s autograph. A beautiful day this weekend, my son and I got out to see the 49ers with a nice victory over the Rams 23-20. The same seats I sat in many times with my dad. The same seats we high fived in and shared many Sundays. It was just too warm! This was summer baseball weather! Candlestick Park in November is supposed to be cold and extremely windy. Instead we sat there in short sleeved shirts looking to keep hydrated. It was a great game and win, but I took note of how quiet it was. In the 70s, the Warriors brought a basketball championship to the Bay Area. In the 80s and 90s, the 49ers turned San Francisco into a football town, but now the Giants own this town and I noted to my seatmate (a baseball executive) that we are definitely a baseball town now. It has been two weeks since the World Series ended, but the buzz is still there. 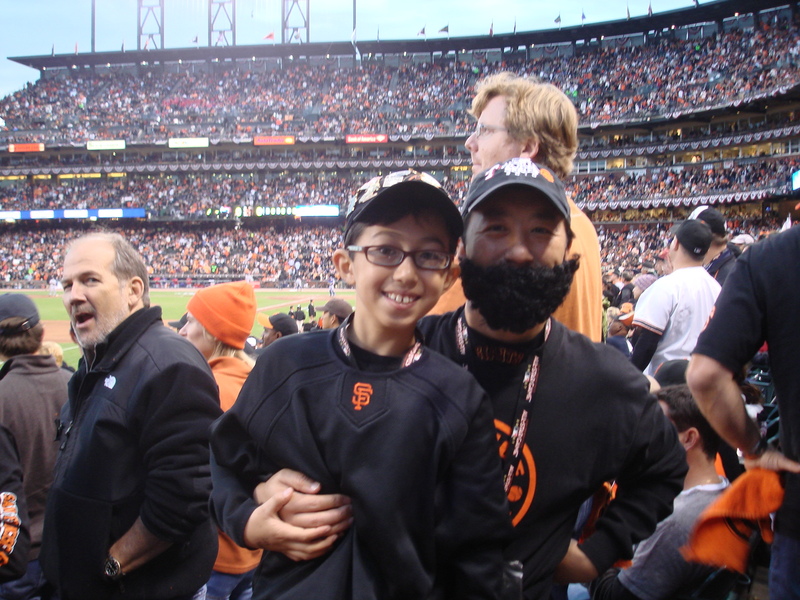 At the 49ers game, many people were dressed in Giants Orange and Black, including me. 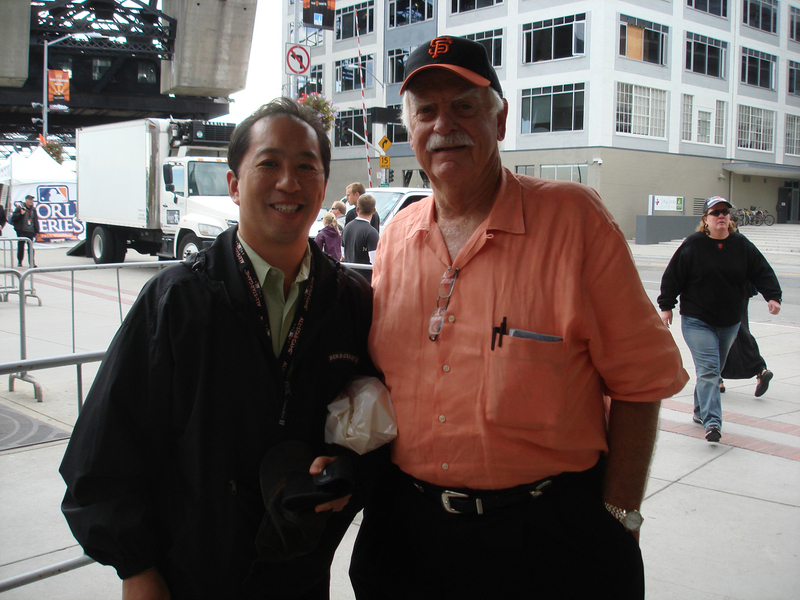 A couple weeks back before World Series Game 2, I ran into Gaylord Perry outside of AT&T Park. I introduced him to my son I didn’t mention anything about his spitter. I just told my son he was the starting pitcher at the very first game I ever saw. I could see the relief on his face that I didn’t mention the thing he was most noted for, and he graciously signed my son’s autograph book. Yep….only 90+ days left til Spring Training. I can’t wait..especially if we continue to have baseball weather and not football weather. 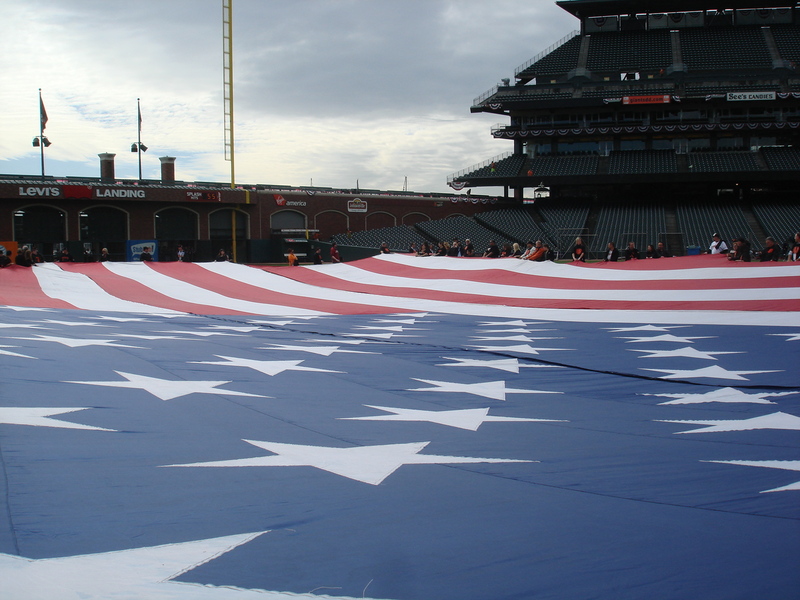 Baseball in San Francisco enjoys a rich history although not one of success with no World Series victories to call its own. 52 years of baseball in San Francisco and while there have been many faces of the franchise, there is no doubt that Mays, Bonds and now Lincecum for the forseeable future will be the legacy names depending upon the generation you call yours. 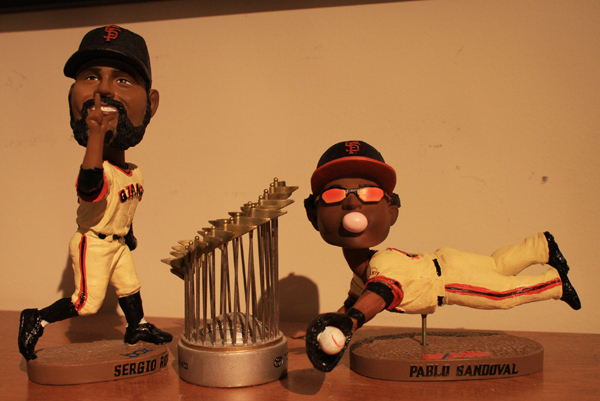 I think the Barry Bonds era is officially over. He’s pretty much forgotten as Tim (“The Freak”) Lincecum has captured the imagination and how holds the torch for the San Francisco baseball community. And while many not have lived long enough to know it, while Barry was so long the face of the community, he really didn’t capture the imagination of San Francisco as much as Willie (“The Say Hey Kid”) Mays and Tim Lincecum have done. He stood on a pedastal while Willie and Tim have personalities that reflect the San Francisco of their times. Although I was only 5 years old when Willie Mays handed me his autographed baseball while I handed him some steaks as we stood in the freezer of my grandfather’s butcher shop, I remember it like it was yesterday. Willie moved to San Francisco and the City was electrified by this young “African-American” who had enthusisam and personality that transcended racial barriers. Willie Mays, along with my grandfather, a Chinese butcher, who through some luck had come into some money were still in a racially divided society despite the liberalness of San Francisco in the early ’60s. My grandfather, was unable to purchase a home outside of the Chinatown community. My grandfather had earned some money from the sale of his butcher shop to the City of San Francisco so they could build what would eventually become the current Moscone Convention Center. At the same time Willie Mays was refuted the ability to purchase a home and later chased out of his neighborhood. Then mayor, George Christopher, a Greek man who embraced civil rights, took both men in at separate times and they became friends. My grandfather was eventually introduced by the mayor to another Greek man, John Vrahos, who helped my grandfather to become one of the first Asian homeowners in the ritzy suburb of Menlo Park which ironically today is heavily populated by the Asian community despite small print on most land deeds which still state that the property should not be sold to a person of color. Although my grandfather died almost a decade ago, when I see Willie Mays today, he still greets me and calls me “Phil’s grandson”. I never got to ask my grandfather but in many ways I feel like Willie might have been his first black acquaintance and the for Willie, my grandfather might have been his first Asian acquaintance. Tonight I watched my son sit mesmerized in front of the television as he watched Tim Lincecum mow down the Houston Astros. 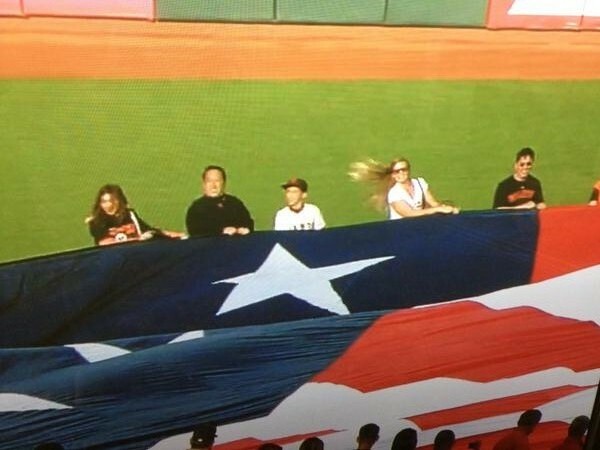 Lincecum’s long hair is being copied by children all over San Francisco’s Little League fields such that you can barely tell the boys from the girls. More importantly he is relating to a new generation of fans. Walking his dog around the city with his girlfriend, Lincecum looks like any 20-something on the street. His dimunitive size for a baseball player allows him to mesh in with the tourists and not call much attention to himself. What is happening in San Francisco with Lincecum is truly unique. Mays is undoubtedly the best player that ever played the game and those who grewup watching him were lucky. With 2 Cy Youngs in his first 3 years, Lincecum is definitely one of the brightest stars in the game and I hope my child will some day look back and see how lucky he was to have grown up a Giants fan idolizing a future Hall of Famer. …..this isn’t about a basebll no-hitter tonight. It is about a man, a pitcher, his father, and second chances. It is about taking a step back to take a giant leap forward. We all hear of stories of second chances. Right now, for example, Lance Armstrong is coming back from his second retirement to race in the grueling Tour de France to help bring awareness to cancer. We see how adversity has made him stronger not only physcially, but mentally. Tonight history was made for the San Francisco Giants as Jonathan Sanchez pitched a no-hitter. As any sports fan can attest when something happens for the team or teams they root for, they will always remember what they were doing. In fact tonight was the first time a Giants pitcher had pitched a no hitter in San Francisco in 34 years. On that day my father took me and some friends to a double header where I saw Ed “Ho-Ho” Halicki pitch a no-hitter against the Mets at Candlestick Park. As I watched tonight’s game, I started thinking about that day with my dad. It was an incredible twist of fate for Sanchez. He was out of the Giants rotation and was in the doghouse. The newspapers were talking about him being traded. In fact things got so bad that no other teams were willing to trade for him. Now after this evening he is untradeable. How unpredictable was this? Only the fact that former Cy Young winner, Randy Johnson, got injured was Sanchez pitching tonight. The accomplishment was even more surprising given that the Giant’s starting pitching rotation consists of 3 Cy Young winners (Lincecum, Johnson and Zito) and a 4th pitcher who some argue has pitched better than them all (Matt Cain). Sanchez was the forgotten one. He was down on himself, kicked out of the rotation and replaced by a 28 year old rookie. So down was he that his father flew in from Puerto Rico just to give his son some support. It was the first time he had ever seen his son start a Major League Game in his 5 big league seasons. The personal story of Jonathan and his dad played out perfectly. His father fought back his tears as the embraced in the dugout and he told his son the words at the top of this entry. Fate also brought him together with his rookie catcher for the evening, Eli Whiteside, also a great story. The Giants regular catcher was at the hospital with his wife who is expecting, and was told only hours before the game that he would be catching. So it was by chance that this unlikely duo were thrust upon the scene and they will forever be linked. Jonathan Sanchez’s name will go up on a wall in Cooperstown, as the 262nd no-hitter in history. His father is right, second chances are something we all don’t get much of, but when we do, we need to take advantage of them. Listening to the announcers, Sanchez had consulted for many days with anyone who would listen and worked countless hours on his own to fix his delivery and most of all learn to keep his head in the game. He had some good help. Randy Johnson, pitching coaches, Dave Righetti and assistant pitching coach Mark Gardner had all pitched no-hitters before and given him the mental knowledge. Not only had Sanchez never pitched a major league no hitter before, he had never pitched a complete game or a shutout, never having completed eight innings in a big league game. He got to uncharted waters and finished it. Back in our daily lives my wife and I sat there and watched the story unfold and talked about how special this evening was for this young man and how his perseverance was something to learn from. When my mother-in-law called the other day, we thought she was calling to wish us a Happy 15th anniversary, she was calling to tell us my father in law is in the hospital fighting an infection with a 102 degree fever. Along with a couple of parents around us dying of cancer, it served a reminder that we are in our second chance right now with recovery from my wife’s cancer. In fact we need to come out better than before. Those with adversity like Jonathan Sanchez and Lance Armstrong seemed stronger because of the level of “fight” they needed in ther bodies. So this week we will be celebrating our second chance with a delayed anniversary celebration. They say that true sports fans root for the laundry and not for the players themselves. I truly do root for the players. I root for their stories of how they came to be. I root for the human spirit within us all and the events which make that spirit in each one of us burn brighter than before. Jonathan Sanchez represents all that is right. Their individual stories are inspiring in themselves. As my wife saw the events unfold and heard the announcers provide color to the story she started rooting for “Johnny” Sanchez. She wanted his second chance to be successful and I saw she was also rooting for the human spirit. Sanchez , as you might hear Randy Johnson tell you, has just as much talent as anyone on the team which says a lot. Congratulations to Johnny Sanchez and all the people out there who have had a second chance. They say no-hitters are great timing, great talent, and a little good luck. Well, I think sometimes you have to make your own luck and you have to put yourself in the situation to have good luck. It reminds me of the quote from one of my favorite actors, Gene Hackman, from the movie, “The Replacements” : ” I look at you and I see two men: the man you are and the man you oughtta be. Someday those two men will meet”. Tonight, they met for Jonathan Sanchez. I borrowed the title of this blogentry from the new Black Eyed Peas album. The last couple of days just hit me kind of hard if you hadn’t guessed. Although three years have passed, the memories of my father are still strong and I’m learning they will always be withme. Although my father probably didn’t have a very tight relationship with his father, I’m sure there was enough to hold onto that lasted a lifetime for him. My life is spent trying to make those long lasting memories for my own children. If I were to leave them prematurely I want them to have something to hold onto and cherish as their own. The night before Father’s Day we went out to a night baseball game that had a pre-game ceremony to honor Randy Johnson as only the 24th pitcher to reach the 300 career wins plateau in Major League Baseball. This is out of the over 8000 pitchers who have ever thrown a baseball in the major leagues. There in person were greats such as Tom Seaver, Gaylord Perry, and Nolan Ryan and we had front row seats. My son just sat there in awe reading the accomplishments of these men. When I asked him what he got out of it, he told me that none of them reached their goal until they were in their 40s. It is not what I had noted, but it was observant. These men had not only worked hard at their craft but they did it for a long time. Well Father’s Day rolled around and like my dad did when I was a kid, I snuck out of the house to the golf course. Playing San Francisco’s Presidio Golf Course is my way to still play golf with my dad. Years ago I walked the course in the evening and spread my dad’s ashes. It was the route he walked his dog many time and the course that he played on many occasions as it is only two blocks from the house we lived in as a family. There is something about baseball and golf between a father and his child. Whether they are watching or playing, there is lots of time to talk about the little things in life that create the largest memories. It was a beautiful Father’s Day and I was matched up with three other Fathers who had snuckout as well. One of the joys of San Francisco municipal golf that my dad instilled upon me was the fun of meeting new people on a golf course and getting to know them over a course of 5 hours as you stroll beautifully manicured terrain. We were really four strangers walking alone withour thoughts. Occasionally I would stop and stare at a tree or a bunker and could still see my dad playing. I hadn’t played a full 18 holes of golf in several months, but this round was special. I’ve played this course close to 100 times in my life and on this Father’s Day I played my best round ever. I almost matched my dad’s feat of a hole in one on Father’s Day as I missed one by about 2 feet. Probably the closet I’d ever come. Nope, no storybook ending here. It didn’t matter. I had a great day with my dad and I’m sure he would have given me a few pointers and word of advice. I could still feel his presence behind me reminding me to keep my head down, whistling at my good shots and chuckling at my lousy ones and shaking his head. I came home to watch the US Open and the video clip above played. It is the story of a family that lost their father prematurely 10 years ago just a few months after their father (Payne Stewart) had one of his career highlights on Father’s Day. It was a sad but great Father’s Day story and tells of how his son still follows in his father’s steps. Myabe everything isn’t identical, but the purpose is similar. The 5 hour hike /walk/ golf round earlier had cleared my head but more than anything gave me peace of mind and although I didn’t match my Father’s hole-in one, I had a renewed energy about playing the course better than ever before. In watching the US Open I rooted for Phil Mickelson, a man tormented by his wife’s pending breast cancer surgery. His co-survivor cancer story mirroring my own, I felt right there with him. On Monday, his charge ran short and he finished as a runner-up in the US Open for a record 5th time. The ending almost looked perfect, but he lost. Then I thought about it. The commentators kept using the words “storybook ending”. If he won the tournament it would have been a great accomplishment, but I don’t think it would have been storybook. He and his wife are facing surgery next week and I’m sure there are many more happier endings that they could think of right now. As my day ended at work I got a phone call. It was my doctor. I knew it would come some day. Cholesterol lowering drugs. I’m in better shape than my father and live a healthier life, but its just my dad’s genetics and this is one legacy I did not want to follow. Let this be a lesson to all out there. I just reached 500 miles run so far this year. I ate steel cut oatmeal 5 days a week for the last 2 years. I have a low weight for my height, yet my genetics still drive a higher than normal cholesterol count. Going back to baseball I just read the story of 1st baseman Joey Votto of the Cincinnati Reds who lost his father last August. Baseball was his connection to his father and suddenly without him there, he just couldn’t do it anymore. The man who played catch with him, coached him, and taught him how to respect and love the game was no longer there to enjoy it with him and he didn’t know how to do it alone. He said this past weekend he spent one last weekend in solitude with his father’s memory on Father’s Day but that he is now ready to resume. Yes there were no storybook endings this weekend, just the real world. But that is okay, because as we all can see, the focus and dedication to follow our dreams and goals is what matters as long as that energy never dies. From Payne Stewart to Phil Mickelson to Joey Votto, we see examples of a relationship of a Father and son, a husband and wife, and the communication channel of a conversational sport where life’s lessons can be taught. Payne Stewart’s son Aaron has found a way to honor his dad, Phil Mickelson found a strength to show his wife how much he wants her to fight, and Joey Votto found a way to let his Father’s memory live under a different type of energy. These aren’t storybook endings but they are all nice stories in a chapter of a long book. Today is obviously a more special Mother’s Day than any other for me. Even though I am so happy that I get to celebrate Mother’s Day with my own mother, I am even more grateful that my children get to spend it this year with their mother and for many years to come. Although they probably didn’t the magnitude of how special it was and how we were staring straight into the possibility that this Mother’s Day could have been one without a mom or one with a bit more urgency than we had today, it was not lost on me. They didn’t say it directly, but I knew what they were thinking. They said that it would be sad though for some schoolmates who did lose their mother to breast cancer this year. After they said that, there was silence in the car and when we got back home they each made an additional card for their mother before she woke up. The hugs around the breakfast table seemed more meaningful and sincere that the daily ones and for that I am so appreciative of the moments we still have together. Last night we had a rare chance for one of our date nights. Dinner and a movie seems so simple but I can’t remember the last time we held hands all movie long. Dinner was filled with pleasant conversation especially over the relief that our son had played a decent baseball game. She had hugged our son, wished him good luck and accidentally told him to get some hits for mommy before his Little League game. As soon as she said that she looked at me with the horror of putting pressure on her son. 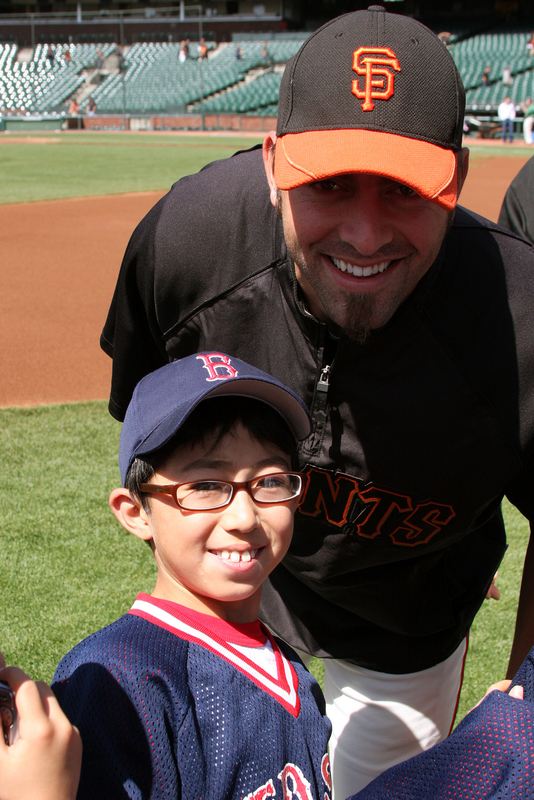 Fortunately he came through and had a couple of hits on his best day ever in baseball. He was so excited to come home and tell his mother that he got two hits. The smile on his dirt covered face not only made her laugh but was a big relief. Some day he’ll probably tell us it was no big deal, but we were hoping he wouldn’t put any pressure on himself. Tonight we’ll spend part of another Mother’s Day with my mother. Although the appreciation of still spending that extra time with her had somewhat dissipated each year beyond her battle with cancer, this year it has been renewed. Since my father’s passing she has visibly taken on much of his persona as well. She’s adopted his adventuresome attitude and more than anything become not just a loving mother that she already was, but a thoughtful icon for me and my siblings to come to in times when we aren’t quite sure about what is right or wrong and reminds us of what our father would want us to do. I can see in her latter years that she more than anything wants her children to spend more time together and makes a strong effort to make that happen on a daily basis. Mother’s Day has become more than that Hallmark Holiday. It is also now a call to awareness to the plight of mothers and their battle with Breast Cancer. I am glad that even baseball has really taken the time to appreciate mothers and use Mother’s Day to bring awareness to Breast Cancer Research. Watching major league baseball players use pink bats and wear pink wristbands tells you that it isn’t just the days of playing catch between a father and son that forms the foundation of future baseball players but also those mothers who drive their sons and daughters from field to field three days a week. While my wife and daughter celebrated with a spa day, I took my son to play 9 holes of golf and were paired up with a 30ish son and his dad. You never know why people are out at a golf course on Mother’s Day without their moms on Mother’s Day. The two men played in silence, but idle chit chat revelaed that they were native San Franciscans and were all aums of the same high school. As it turns out they had recently lost their mom/wife to breast cancer. It was a tough day for them and they were honoring her memory on this day. My son did not hear the conversation, but it really cast more light on the specialness of the day. I smile as I look back at this entry because all I’d want for Father’s Day is a nice round of golf myself ….. At the same time, I want to say how much I appreciate all those moms out there for how much they do for their children whther they are 4 or 40. And for those who have lost their moms or have moms or relatives who are sick, please enjoy what you have and savor it.